By Tara Jones Haaf, Noozhawk Columnist | @NoozhawkNews | March 20, 2019 | 12:44 p.m.
I’m constantly amazed at how many artists and artisans we have in our bustling little city. It’s not often that I meet someone new who doesn’t have some sort of side hustle going on, which includes people who are usually far too busy to even be doing such things. Maybe it’s the constant good weather that gives everyone a dreamer’s optimism or the fact that the cost of living here is insane that makes us all long to do more than just work our 9-to-5 jobs. Of all the people I know in the food and beverage industry, I have yet to meet anyone as tenacious and eager to break through this city’s glass ceiling as Alvaro Rojas. Owner of a Mesa staple and downtown hot spot, Alcazar and Milk & Honey, Rojas has been an integral part of the happy hour scene of Santa Barbara since he opened his first location 19 years ago. Throughout those years, other fun side projects came and went, such as the much beloved Bourbon Room that once was adjacent to Creekside Bar, or the once popular Spare Parts that was pay-by-donation and offered an incredible foodie experience on Sunday afternoons in what was left of the old Funk Zone neighborhood. It’s no surprise to me that when I first caught wind of Glass House Cocktail Garden, it seemed exactly like the type of place Rojas would invent. Swathed in twinkling lights and staged like a photographer’s dream photo shoot, Glass House is an oasis nestled between the current droll of lower State Street. It offers a place of escape for an hour or so where one can linger over inventive and beautifully crafted cocktails. 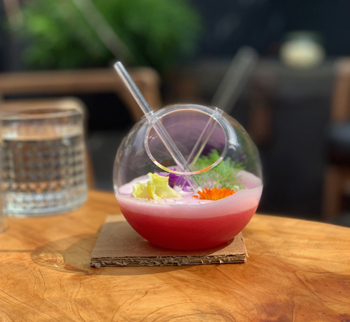 The name of this cocktail lounge is a nod to the Santa Barbara Orchid Farm’s all-glass greenhouse and is not just another bar along the strip. Much thought and effort have gone into making this all-outdoor space a fully sustainable gem. 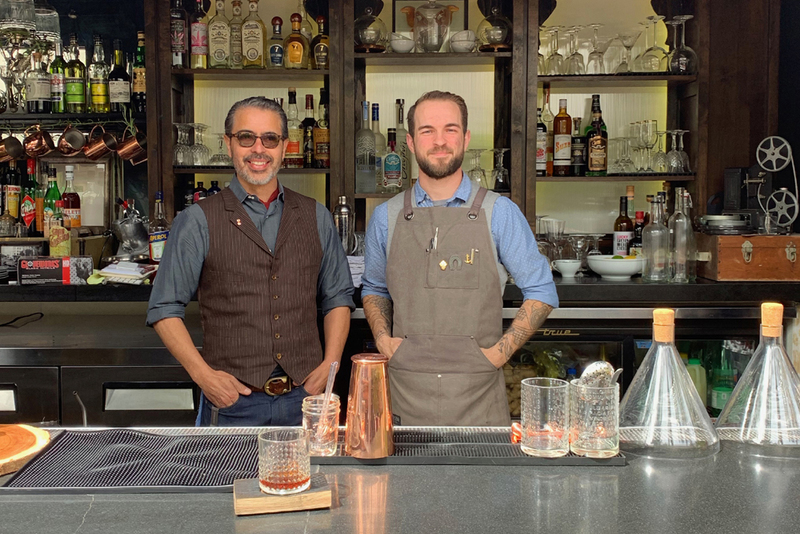 For the past two years, Rojas has partnered with Santa Barbara Aquaponics to learn about and immerse himself in the art of sustainable farming practices, which has led to the bounty of ingredients one can find not just in the libations at his new bar but also at his other locations. 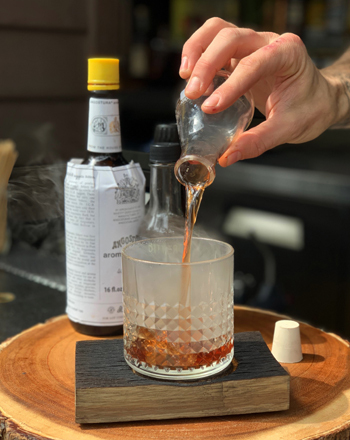 Plus, his relationships with artisans such as Ian Cutler of Cutler’s Artisan Spirits and wine aficionado Jeremy Bohrer, former owner of Still and Five & 1/4, are what qualifies these libations as top tier and makes the wine list just as intriguing as the cocktails. Rojas isn’t alone in this endeavor. Kyle Peet, formerly with Alinea Group’s The Aviary, which was recently featured on Chef’s Table, has joined him to get this pet project off the ground. While Peet recently hails from Chicago, we can say that we knew him first during his early days in the industry, including time spent tending bar at the former Funk Zone staple Red’s, and a handful of other local establishments before joining the team at Rojas’ various places six years ago. 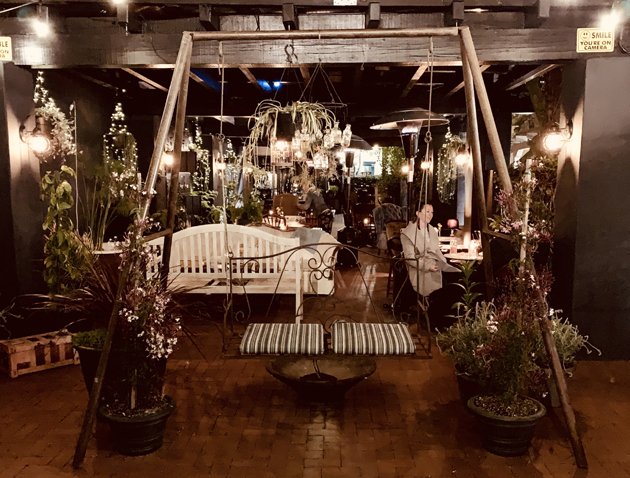 Together, the two have combined their talent behind the bar and in the farming industry, plus their love of the history of botany to create this secret garden getaway. The cocktail menu, décor and vibe are an homage to David Grandison Fairchild, who is credited with introducing more than 200 exotic plants and varieties of established crops to the United States. Each section of the lounge pays tribute to Fairchild’s travels around the world, from the Asian-inspired tuk tuk bar near the entrance where walk-in patrons can enjoy tapas-size cocktails to the sleek seating in the back paying tribute to his time in New York. And, of course, the cocktails follow suit with inspired exotic ingredients. If you find yourself without a reservation, which I highly recommend, the walk-up tuk tuk bar is just the place to be where one can find off-menu cocktails to try, such as the Lince Rossa, a seltzer-like libation with heavy ginger notes and a refreshing tropical finish. Coming in pairs? Order a shared cocktail such as Prickle My Fancy, a rum-based drink that tastes like springtime with hints of prickly pear, ginger, lime and mezcal served in a terrarium-type glass. Not all after-work projects amount to much for most of us, but Rojas has a special way of turning a side hustle into a Santa Barbara staple. One visit to this sure win in a sea of State Street triumphs and flops, and you’ll wonder why it hasn’t been here all along. Glass House Cocktail Garden can be found at 630 State St. in Santa Barbara. The hours of operation are 4 p.m. to 1 a.m. Thursday through Sunday as well as Farmers Market Tuesdays that will feature local artisan pop-up stands and a limited bar menu. Click here for more information. The grand opening is set for Thursday. Reservations can be made by clicking here; they are not required but are recommended. — Tara Jones Haaf leads Eat This, Shoot That! and welcomes reader tips and ideas for future columns. She can be reached at tara@eatthisshootthat.com. Click here for previous columns. The opinions expressed are her own.